A recent issue of Fight On!, dedicated to Paul Jaquays, quotes his classic Judges Guild adventure, The Caverns of Thracia: “Nothing seems to scare someone who knows the rules like something totally unknown.” That’s where the “Princess Box,” properly known as the Lamentations of the Flame Princess Weird Fantasy Role-Playing boxed set comes in. Not because this game is totally unknown (it is based on Basic D&D (via OGL) after all), but because it’s different in the right places. There are rules changes between the “Princess Box” and the other B/X retroclones and play-alikes, to be sure. The mood of the low-magic deadly sword and sorcery is a great contrast to the high-fantasy vibe one gets from B/X (at least in the way it’s often played). It’s the gaming philosophy expressed in all elements of the boxed set and the copious amount of suggestions and advice that is included that makes this box its own game. 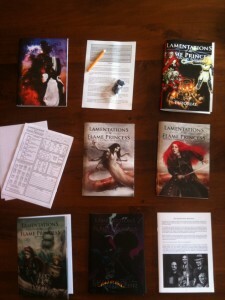 In the year since James Raggi started his Lamentations of the Flame Princess publishing company, he’s managed to become one of the more well-known and occasionally polarizing figures in the old school scene, enthusiastically promoting his vision of old school style gaming through his online activity and by publishing several well-received adventures for use with any of the retro-clone or old D&D rulesets. His adventures are well-reviewed for the most part, and known for being dark, deadly and yet not capriciously so. He has one adventure nominated for an Ennie and one honorable mention. Not bad for a year’s work. Now he’s gone and published his own OGL variation, of B/X D&D and put it in a great-looking box with a setting, an adventure and two books of playing advice. He’s put thought into all the things included in the box. All these booklets compliment each other and echo Raggi’s style nicely. The Referee Guide alone is as large as the rules and dispenses advice on establishing mood, building campaigns, making rulings and many other topics. The Tutorial includes an introduction to role playing, a solo adventure and a 14-page play example (the gaming group at that example table is realistically portrayed to the point of hilarity). 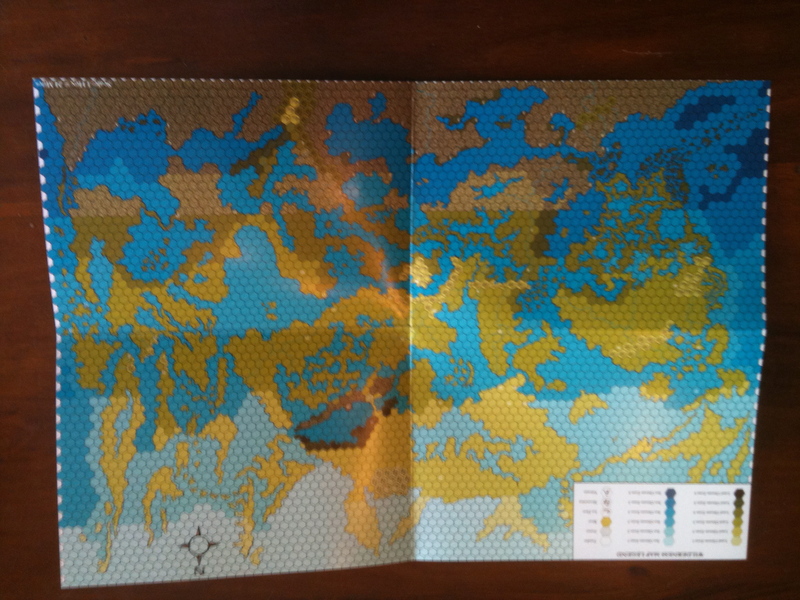 The campaign setting is a sandbox set in the frozen north, with plenty of seafaring opportunities and adventure ideas. It has just the right level of detail—there are no detailed histories or timelines NPC’s to worry about. I also appreciated the liner notes in the included adventure, Tower of the Stargazer. In these, Raggi explains what he’s done with each room and they reflect the style of play the rules were designed to enable. Let me be a bit sexist for a moment. Labyrinth Lord/BX is the girl next door, who you’ve known since you were both ten. She’s beautiful and she’s familiar and she’s just terrific fun. The Princess Box is Labyrinth Lord’s red-haired cousin from out of town. She wears leather, she’s into metal, she’s got a butterfly knife in her jacket and you’re not quite sure what she’s up to. This might be the unsettling effect you want to go for. Which you can do, of course, without this set. But with the set, it’s so much easier to get to something that feels different and new if you’re a novice or returning GM. The booklets are digest sized, with small type. Art is always is a matter of taste, but none of it looks poorly executed. Unlike the TSR days, when line art was the norm, this set uses a wider range of media and styles. The covers don’t seem to be creating a product identity. The box and two of the books use a fantastic painting of a female warrior confronting a bare-breasted demoness. The other covers aren’t close to it stylistically, which isn’t to say they are all bad. But the box cover is the one I want as a poster. And a t-shirt. The box includes graph and hex paper, character sheets, a tiny but nice set of dice and a pencil, which does tend to put little dents in the box lid. Those little touches are nice. What does the box not have? A bestiary or list of magic items. Those you are encouraged to come up with on your own. But there’s enough monster and item stuff out there as it is that you’ll have no trouble coming up with your own variations. The rules themselves are close to what you expect with some notable exceptions. My favorite: in place of the thief is the specialist class, a professional adventurer whose various skills can be improved as the player sees fit, allowing anything from a back-stabbing sneak to a trap-disarming tinkerer. The game uses class-as-race types for elves, dwarves and halflings. There are no resurrection or raise dead spells. No race-based infravision. Is it worth the €50 plus shipping? If you seriously intend to run the game as referee, then yes. If you enjoy owning and reading well-written RPG rulesets, then it’s a steal. Hopefully LotFP can get the rules and spell books published stand-alone or as a pdf. Players will need one of these each for themselves and I think that’s pretty steep for what a player needs. My understanding is that he will release some of this material cheaper at some point soon. People that were decent, honest, innocent, or at least devout in their religion (not all gods care about morality), they will be anxious to answer questions and remain on Earth for as long as possible. They have learned that the afterlife is nothing, simply a void with no effective consciousness and no sensation but for the numbing awareness of passing time. They know that being alive, even inside a rotting corpse for the briefest sliver of time that leaves them in agony as the decay of their physical form leaves every nerve transmitting unrelenting pain, is better than being dead. Cads, scoundrels, and heretics, on the other hand, were pleasantly surprised to not find eternal torture waiting for them in death. Only the vicious and undeserving find this peace in death, and they will be furious about this peace being disturbed. This allows them a saving throw versus magic to resist answering questions. Take away player knowledge by using your own creations. Destroy familiarity by not using, or by subverting, cliché elements of game worlds or adventures… As soon as it is established that the “standards” of the genre are gone, players will take notice, come off auto-pilot and start interacting with the world. And them you can hammer them with the Weird. In many games, player success is assumed, leaving the adventure details to be mere dressing. In a game where character death and/or failure are forever possible, then players will respect things that are supposed to be fearsome within the game. They won’t need to be poked with any rule, because they will know that if their characters act rashly or nonchalantly towards the supernatural, the supernatural will kill them. Not every location in an adventure should be full of adventure. Areas containing nothing of interest keep players guessing… Such areas can also be used to build atmosphere and establish the character of the overall location. The Referee is the final authority in all matters for his campaign, above the letter and spirit of the rules. My copy arrived last week and I’m slowly working my way through the books. It’s not perfect, and not exactly what I would do, but I’m finding the work enjoyable and quite well-executed. And I’m just really impressed that someone put together a box set like this on their own.